Although CFS Leitrim is officially a Canadian military base, it is, like Nanoose Bay, near Victoria, BC, and many other Canadian forces bases, a place that welcomes and exists to serve USA military activities. Located just south of Canada’s capital, Ottawa, (75°W, 45°N), it is the nation’s oldest operational intelligence collection station. 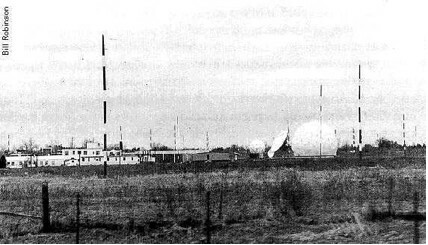 Established by the Royal Canadian Corps of Signals in 1941 as Special Wireless Station and renamed Ottawa Wireless Station in 1949, CFS Leitrim acquired its current name when the Supplementary Radio System was created in 1966. In 1946, the station’s complement was 75 personnel. The current strength is 450 military personnel and 28 civilian employees. So much for peacetime demilitarization. Leitrim now exists to serve a USA military purpose. Although Canada has no enemies, we are on a war footing with the highest military budget in history. We are fighting a war for USA oil access in Afghanistan under the lie of establishing democracy. Yet the day before Stephen Harper went on his “defending democracy” trip to Afghanistan, Malalai Joya, one of few women MPs in that country, was suspended from parliament for criticizing the conduct and composition of the Kabul government. She claims that warlords that dominate the parliament of Afghanistan and that 60 per cent of those elected to parliament are part of warlord groups, many of whom are responsible for war crimes committed during the civil war from 1992 to 1996. An international campaign to have the warlords held to account failed when the parliament decided to offer immunity for all past war crimes. She says that women still have no fundamental rights or security in Afghanistan; she is continually threatening and attacked. Yet the Canadian military told Women in Black on Navy Days that Canada is in Afghanistan so that women there can have the same rights we have in Canada – but not a peep from our government about the treatment of Malalai Joya. Instead Canada is increasingly more and more integrated with the USA, a process that began after WW2 and continues to expand in international policy and militarism initiatives. Under the little known or discussed Security and Prosperity Partnership Agreement, many fundamental areas of Canadian politics and culture are to be furthered dominated by the USA, including the Armed Forces. CFS Leitrim is a key part of our compliance with USA militarism. It is part of a programme of exchanges between Canadian and American military units. In 1985, The USA military installed there the first of four satellite antennas. Officially, the mission of the station is the “cryptologic rating” and the listening of diplomatic communications. It is actually part of the ECHELON spy system. Patrick S. Poole, Deputy Director, Center for Technology explains the ECHELON system in, “Free Congress Report, ECHELON: America’s Secret Global Surveillance Network. “The National Security Agency (NSA) has created a global spy system, codename ECHELON, which captures and analyzes virtually every phone call, fax, email and telex message sent anywhere in the world. ECHELON is controlled by the NSA and is operated in conjunction with the General Communications Head Quarters (GCHQ) of England, the Communications Security Establishment (CSE) of Canada, the Australian Defense Security Directorate (DSD), and the General Communications Security Bureau (GCSB) of New Zealand. These organizations are bound together under a secret 1948 agreement, UKUSA, whose terms and text remain under wraps even today. The ECHELON system is fairly simple in design: position intercept stations all over the world to capture all satellite, microwave, cellular and fiber-optic communications traffic, and then process this information through the massive computer capabilities of the NSA, including advanced voice recognition and optical character recognition (OCR) programs, and look for code words or phrases (known as the ECHELON “Dictionary”) that will prompt the computers to flag the message for recording and transcribing for future analysis. Intelligence analysts at each of the respective “listening stations” maintain separate keyword lists for them to analyze any conversation or document flagged by the system, which is then forwarded to the respective intelligence agency headquarters that requested the intercept. … ECHELON is also being used for purposes well outside its original mission. The regular discovery of domestic surveillance targeted at American civilians for reasons of “unpopular” political affiliation or for no probable cause at all… Among the activities that the ECHELON targets are: Political spying – since the close of World War II, the US intelligence agencies have developed a consistent record of trampling the rights and liberties of the American people. One of the most shocking revelations came to light after several GCHQ officials became concerned about the targeting of peaceful political groups and told the London Observer in 1992 that the ECHELON dictionaries targeted Amnesty International, Greenpeace, and even Christian ministries and– Commercial Espionage- since the demise of Communism in Eastern Europe, the intelligence agencies have searched for a new justification for their surveillance capability in order to protect their prominence and their bloated budgets. ….The European Parliament is now asking whether the ECHELON communications interceptions violate the sovereignty and privacy of citizens in other countries. In some cases, such as the NSA’s Menwith Hill station in England, surveillance is conducted against citizens on their own soil and with the full knowledge and cooperation of their governments. Most Canadians have never heard of ECHELEON and even Ottawa peace activists know little of what transpires at Leitrim. In the UK many people know about ECHELON because a brave group of activists keeps watch on Menwith Hill and regularly demonstrate outside and sometimes enter the facility – and are jailed for their efforts. These spy bases are part of a larger system of the USA military spreading complicity with its policies to its many allies, in particular, United Kingdom, Canada and Australia. Governments of these countries, regardless of their position on the political continuum, have always been willing to cooperate with USA military. Canada has been a happy testing ground for everything from Cruise missiles to low-level test flights to underwater weapons systems. Canada has been a willing provider of uranium for USA military/civilian since 1944. Canadians should know about the willing military complicity of all our national governments. We have gone from the ‘Cold War’ to the ‘War on Terrorism’ with barely a blip, and little public dialogue on the desirability, the affects and results in geopolitical terms of our acceptance of these bases. Military complicity is rarely an election issue in Canada. If we do not wake up and act soon we will be one nation under Washington from Ellsemere Island to Chiapas with a risky new currency, the AMERO, based on the failing USA dollar, designed to spread the USA war debt on us, and we will be just one more of those US of America states, the NORTH AMERICAN UNION (Mexico, which is actually the USM, will be another one; calling the USA, the US, is part of the new imperialism). And we won’t be able to tell one soldier from another at any of our so-called Canadian bases – not that it will matter; they, their guns, bombs and computers will all be one in readiness to rule the world.